The fifth time was the charm for the Super Screener’s #1 pick for the win, Exaggerator, who finally turned the tables on a game Nyquist that did all the work up front and succumbed to the predicted hot, pressured pace to finish a very respectable third. The Pimlico race track came up sloppy for a second year in a row, a surface that Exaggerator relishes and, add the fast pace, you have the formula anticipated by the Super Screener for the perfect win conditions. Take nothing away from Nyquist, our second choice in the Super Screener. He was the only forwardly placed horse to hit the board as the rest of the front runners faded badly back through the field. We anticipated accurately that from a form cycle and pace perspective, he might be vulnerable for the win. As the track conditions continued to deteriorate in the morning, we added two new tickets to the Medium and Large wagers moving up the closers, including Cherry Wine to the second place spot. Cherry Wine certainly loves the slop and showed it again with a strong late run to just nip Nyquist at the wire for the place. Our top 20-1+ bomber long-shot pick, Lani, despite yet another slow start out of the gate, did not disappoint unleashing a furious late run closing in on Stradivari with every stride but came up short and finished a close 5 th defeating the remaining five 20-1+ long shots in the process. As we introduced last year, the Preakness usually comes up chalky so we added Pick 4 wager recommendations to our book. This year was particularly challenging as so many scratches were taking place even into the afternoon. In the end though, we published five Pick 4 tickets and all five hit including the $1 Pick 4 ticket that returned $333.30. Vertical wagers came back chalky again this year but we did manage to cash on a handful of Trifecta tickets and a $2 Superfecta ticket that punched in at $634. • Super Screener top win pick and most reliable board hitter, Exaggerator, won and defeated the undefeated Nyquist in the process. • Nyquist, our second choice finished a game third after doing all the work up front. • Our top 20-1+ long shot pick, Lani, out ran all other 20-1+ long shots to finish 5th. • All five Pick 4 tickets hit with each $.50 ticket paying $166.65 and the $1 ticket returning $333.30. • We hit on Trifecta tickets and a $2 Superfecta that produced a $634 payoff. On to the Belmont and with Nyquist expected to take a break, look for a full field and one that will include several Kentucky Derby starters returning after the rest up as well as some interesting new shooters. We’ll have it all analyzed for you in the Belmont Stakes edition of the Super Screener. Thanks to all of you our loyal buyers and those new to our Super Screener product. It is a pleasure to serve you and we look forward to another accurate analysis and successful outcome with this year’s Belmont Super Screener. 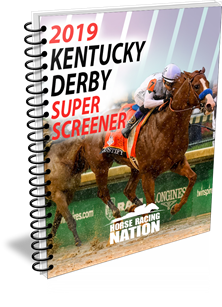 ← Previous Story Top Super Screener Choices SCORE on Kentucky Derby 2016! 12-1 Top Pick Ghost Hunter Upsets Arlington Handicap!